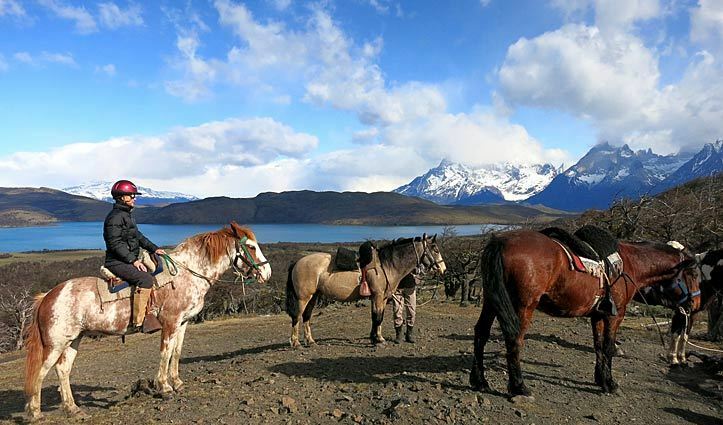 I had quite a few activities on my wish list for my time spent in Chile, but horse riding in Patagonia through the remarkable landscape was at the top. On my last day in Chile at Tierra Patagonia I made this wish a reality. After an early start we were driven to Cerro Guido Estancia, a Patagonian sheep ranch set on over 100,000 hectares of rolling hills and pampas. Carlos our guide, a local beret-clad gaucho, helped us don helmets and chaps before leading us out on our morning ride. We rode through verdant forests, crossed clear mountain streams and climbed up and down scree-covered slopes, all whilst experiencing the regions apparently typical weather; from sun rays in a cloudless sky to the wind howling and falling sleet. 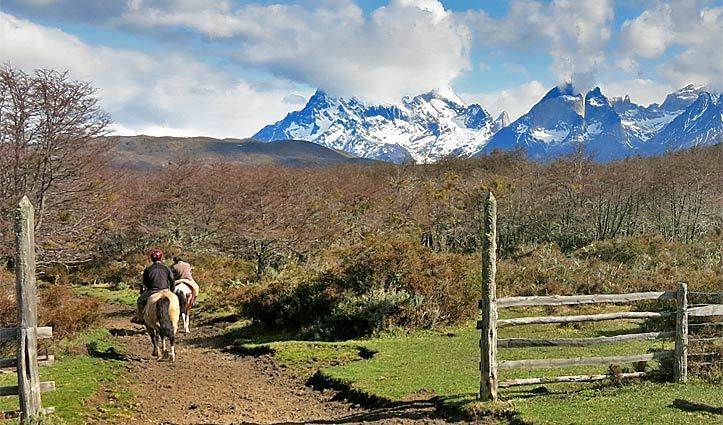 On arrival at a lookout point, the sun reappeared offering us panoramic views of the valley of Cerro Guido, Lago del Toro and the mighty Paine Massif. As we made our way back towards the estancia, and as if on cue, an Andean condor soared above – the perfect end to our ride. 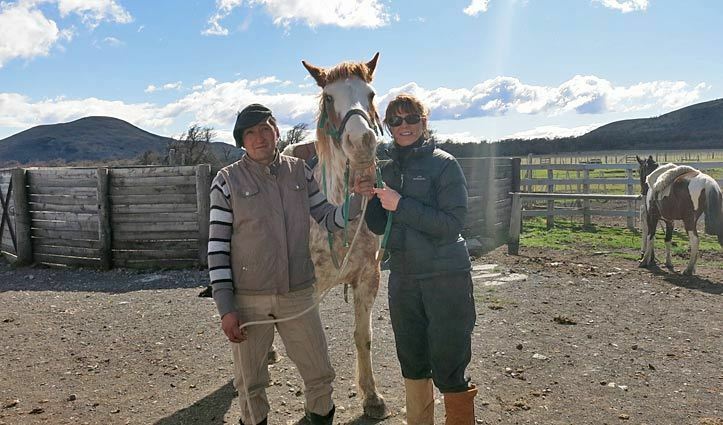 Back at the stable we bade farewell to our sure footed equine companions and to our surprise, Carlos invited us into his house, where we meet some other gauchos and the cook who was preparing lunch for the stable workers. 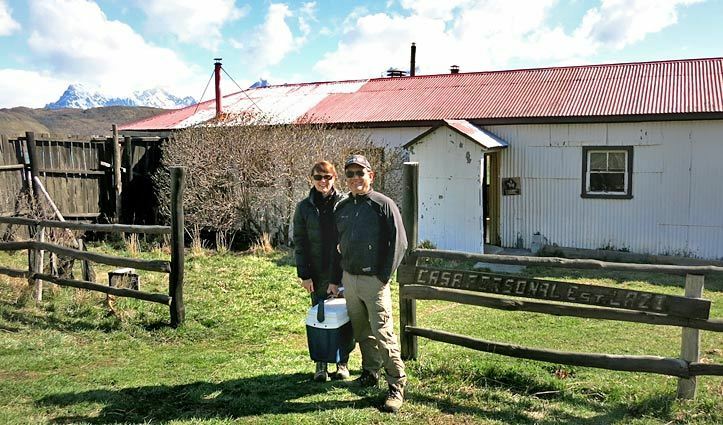 Gathered around the wood-fire stove, we asked lots of questions about life on the estancia, all the while surrounded by the smells of roast lamb, potatoes and home-made bread. To our delight the cook placed a plate of succulent Patagonian lamb and plump potatoes in front of us. We were humbled by their generosity. As gracious guests we enjoyed one of the most delicious meals we’d experienced in Chile with our new found friends in Patagonia. As I waved goodbye I reflected on what a privilege it was to enjoy a day with Carlos and to experience a glimpse into the gaucho way of life. The pristine beauty of Patagonia and it’s equally beautiful inhabitants has been etched in my mind forever.